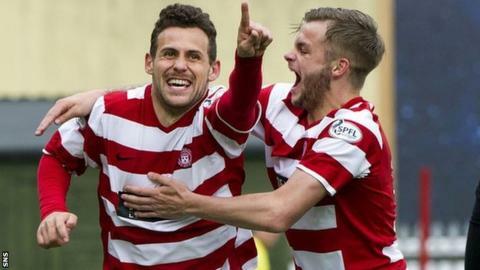 Hamilton Accies equalled their club record league victory by ripping Morton apart with a blistering 10-goal show. But they fell short of winning the Scottish Championship title due to Dundee's win at home to Dumbarton. Tony Andreu hit a first-half hat-trick and Mickael Antoine-Curier bagged four goals in the rout. Michael Devlin, Louis Longridge and Stuart Findlay's own goal gave Accies their other goals, while Dougie Imrie scored twice for Morton. The margin of victory meant Hamilton clawed back the eight goals they needed to capitalise had Dundee drawn with Dumbarton. And while Accies had to settle for second spot, their dream of promotion remains as they now enter the play-off process. Any nerves the home side had on a day of such significance were eased within four minutes. Accies won two corners in quick succession and, when Grant Gillespie swung in the second of those, Antoine-Curier stooped to head in at the near-post. Things got even better for Hamilton three minutes later. Superb work by Longridge down the left culminated in a cut-back that just evaded Andy Ryan but fell nicely for Frenchman Andreu to poke home from a couple of yards. At that point, it looked to be cruise control for Accies on what was being termed 'helicopter Saturday'. However, Morton then pulled one back. Former Hamilton forward Imrie produced a finish of real quality, dispatching a left-footed half-volley into Kevin Cuthbert's top right-hand corner. The hosts moved quickly to show it was no more than a minor set-back and further enterprise by Longridge on the left wing resulted a half-clearance that Championship player of the season nominee Andreu sent crashing low beyond Morton goalkeeper Nicolas Caraux. Three became four when Longridge deservedly got a goal of his own in the 34th minute. It was a clinical drive from 25 yards the 22-year-old hit crisply into the bottom left corner. Referee Steven McLean then awarded Hamilton a penalty after Lee Kilday's header hit the hand of Rowan Vine in the six-yard box. Up stepped Andreu to calmly send the spot-kick to Caraux's right to complete his first-half hat-trick. Within two minutes of the second half, Morton got a penalty of their own; Kevin Cuthbert judged guilty of felling Imrie. However, the goalkeeper redeemed himself by diving left to save Vine's weak effort. Antoine-Curier immediately made Ton rue that miss when he tapped in his second for the hosts at the back-post. The head of Devlin added a seventh before Imrie's sublime finish gave Morton their second. Ziggy Gordon's excellent centre teed up Antoine-Curier for a side-foot finish that marked the striker's hat-trick. Morton's day got worse when young defender Findlay put through his own net and that pain was compounded by Antoine Curier's fourth, and Hamilton's tenth. An unbelievable encounter made bittersweet by Hamilton missing out on the title, but they will now fancy their chances in the play-offs. Match ends, Hamilton Academical 10, Morton 2. Second Half ends, Hamilton Academical 10, Morton 2. Corner, Hamilton Academical. Conceded by Scott Taggart. Goal! Hamilton Academical 10, Morton 2. Mickael Antoine-Curier (Hamilton Academical) left footed shot from the centre of the box to the bottom left corner. Own Goal by Stuart Findlay, Morton. Hamilton Academical 9, Morton 2. Attempt missed. Louis Longridge (Hamilton Academical) right footed shot from outside the box is too high. Corner, Morton. Conceded by Blair Currie. Attempt saved. Thomas O'Ware (Morton) right footed shot from the centre of the box is saved in the top left corner. Attempt saved. Barrie McKay (Morton) right footed shot from the left side of the box is saved in the bottom right corner. Darren Cole (Morton) wins a free kick on the left wing. Goal! Hamilton Academical 8, Morton 2. Mickael Antoine-Curier (Hamilton Academical) right footed shot from the centre of the box to the bottom right corner. Attempt missed. Mickael Antoine-Curier (Hamilton Academical) header from the centre of the box is too high. Substitution, Hamilton Academical. Ali Crawford replaces Grant Gillespie. Paul George (Hamilton Academical) wins a free kick in the defensive half. Substitution, Hamilton Academical. Paul George replaces Andy Ryan. Goal! Hamilton Academical 7, Morton 2. Dougie Imrie (Morton) right footed shot from the right side of the six yard box to the top right corner. Assisted by Rowan Vine. Goal! Hamilton Academical 7, Morton 1. Michael Devlin (Hamilton Academical) header from the centre of the box to the top left corner following a corner. Corner, Hamilton Academical. Conceded by Dougie Imrie. Substitution, Hamilton Academical. Blair Currie replaces Kevin Cuthbert. Louis Longridge (Hamilton Academical) wins a free kick on the left wing. Scott Taggart (Morton) is shown the yellow card. Jon Routledge (Hamilton Academical) wins a free kick on the left wing. Foul by Barrie McKay (Morton). Attempt saved. Mickael Antoine-Curier (Hamilton Academical) right footed shot from the centre of the box is saved in the top right corner.